Pro-Ject 2-Xperience 2-Pack review | What Hi-Fi? It’s surprising what a slab of clear acrylic and a dash of carbon fibre can do. Take the 2-Xperience 2-Pack – it looks flashy and exciting straight out of the box (at least once you’ve put all the various pieces together). We’ve already had some, er, experience of the Xperience in previous years, but never this combination of tonearm and cartridge. Pro-Ject’s striking 9cc Evolution arm features a conical, carbon fibre tube fitted with Ortofon’s 2M Blue moving-magnet cartridge. Instead of sitting underneath the platter, the motor is decoupled and sits suspended to help ward off the effects of unwanted vibrations. In a similar vein, each of the three feet has a Sorbothane inlay to give more pliant isolation for the deck. Assembly includes positioning and ensuring the drive belt sits level along the middle of the platter – you will also notice the absence of any switch to change speed. This requires a spot of manual labour – moving the belt from one motor pulley to the next, depending on the required speed. It isn’t as convenient as being able to flick a switch, but vinyl junkies will love the chance to get hands-on. 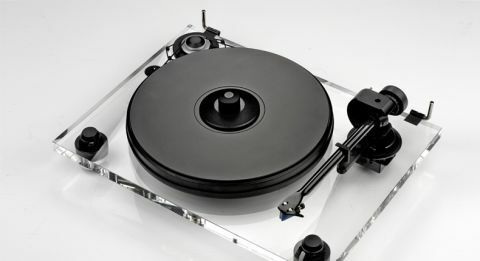 The Pro-Ject is the only model here to come with its own record weight – the hefty disc-like device screws onto the spindle and sandwiches the record between itself and the vinyl-topped MDF platter. Pro-Ject claims this gives the ‘perfect playback platform’. Experiment for yourself and see if you can hear a difference. In our opinion, having the weight in place allows music to sound a touch clearer and more solid. And in general, these are areas where the 2-Xperience 2-Pack scores highly. Playing Michael Jackson’s Smooth Criminal there’s a real sense of solidity to the pounding heartbeat at the beginning of the track. It’s soon substituted for the track’s bruising bassline and snappy percussion hits. It’s an exciting sound for sure. The only area where we’d ask for more is when it comes down to uncovering the subtle nuances of the track. Sometimes, more delicate moments feel as though they’re being washed over and ever so slightly steamrollered by the Pro-Ject. Timing suffers, and the turntable doesn’t communicate as fluently and deliver the same dose of sonic charm as its closest rivals. Still, this is a very fine effort, from a fine-looking deck.